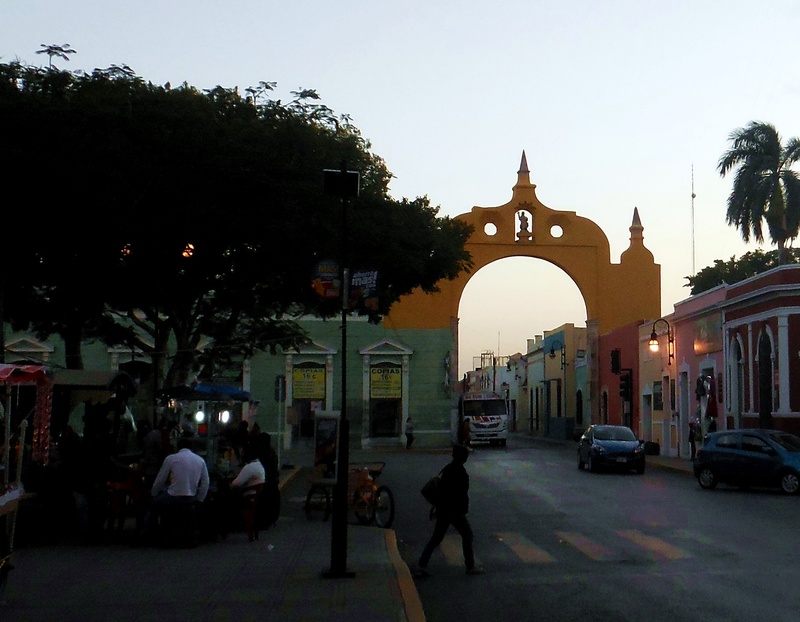 Colonial Arch in Merida, Mexico at sunset. Try saying that when you have had a couple of glasses of Mexican Rosé… Dzibilchaltún, (Dzeebeelchaltoon is the pronunciation and it translates as ‘the place with writing on the walls) is a Maya archeological site close to the city of Mérida in Yucatan, Mexico. Seven small clay or stone figurines were found at the Temple of the Dolls which led to the name and it is built under the ruins of a previous pyramid. 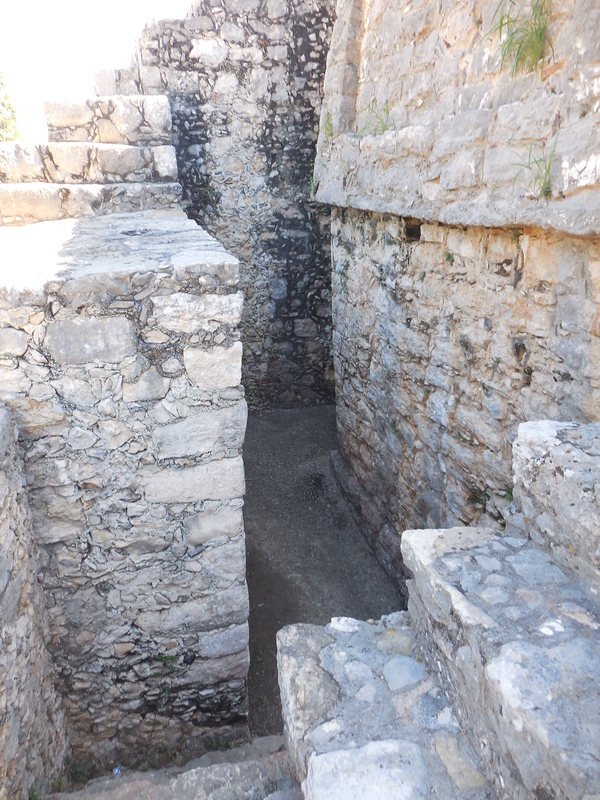 The city has been continuously occupied for 3000 years. It was exciting walking towards the Temple along the ‘sacbe’ or white road wondering what type of religious processions took place there. 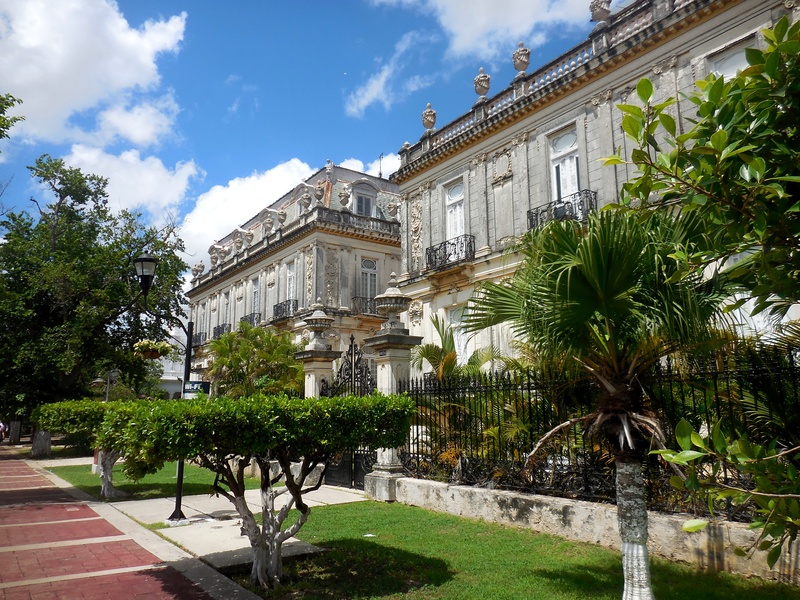 The cenôte is likely the reason why the city was situated in that location and it is one of the largest, deepest in the Yucatan. Dzibilchaltún was a wealthy port, close to the Caribbean and local salt production. 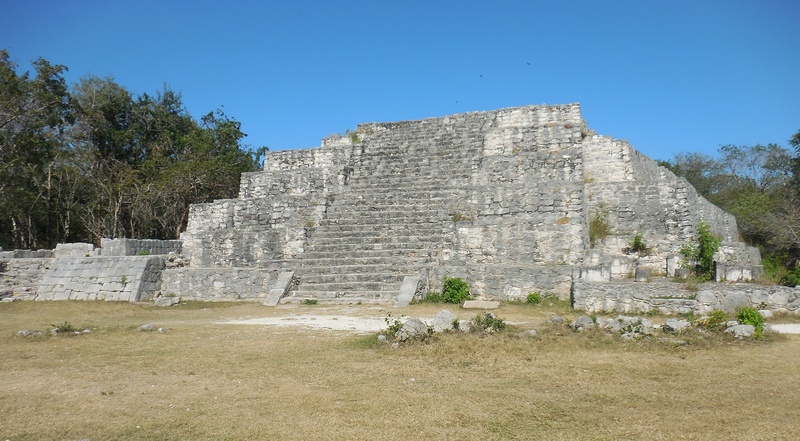 Archeologists have studied just a portion of the site and have found up to 8000 structures – it must have been a buzzing city with a peak population of about 20,000 to 40,000 people, even larger than Mayapan. Dzibilchaltún was not as remote or quiet as Mayapan but still relatively quiet with many local visitors, some expats and non-tourists just like me! 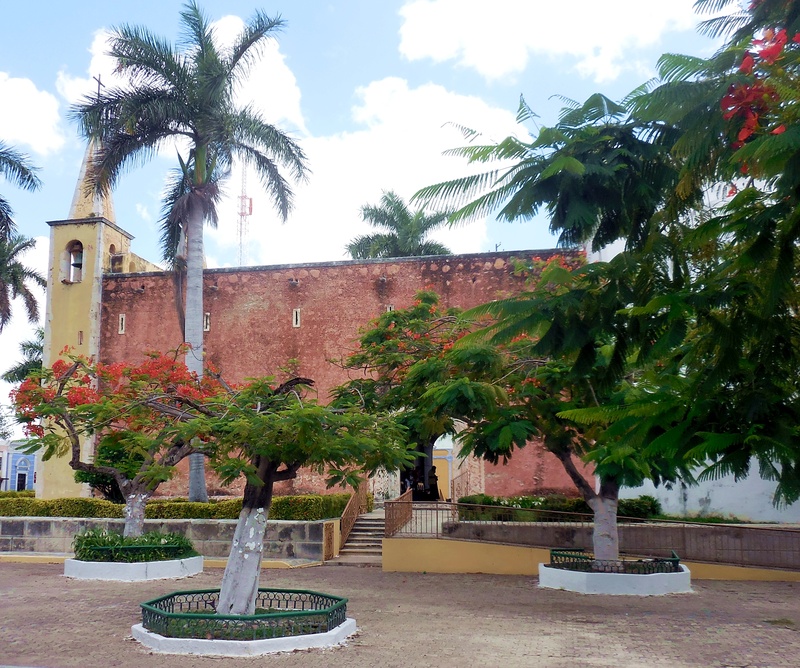 Throughout the ages Dzibilchaltún has changed from a city to a town to its current status as a village. 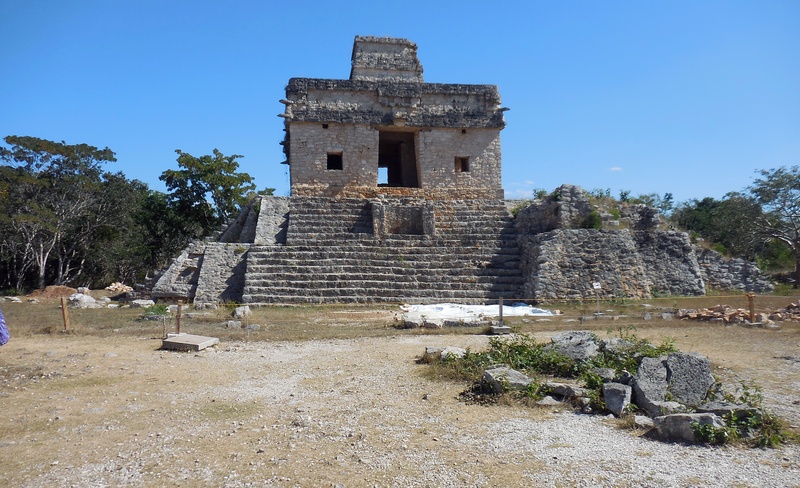 It began to decline in popularity after the rise of Chichen Itza. 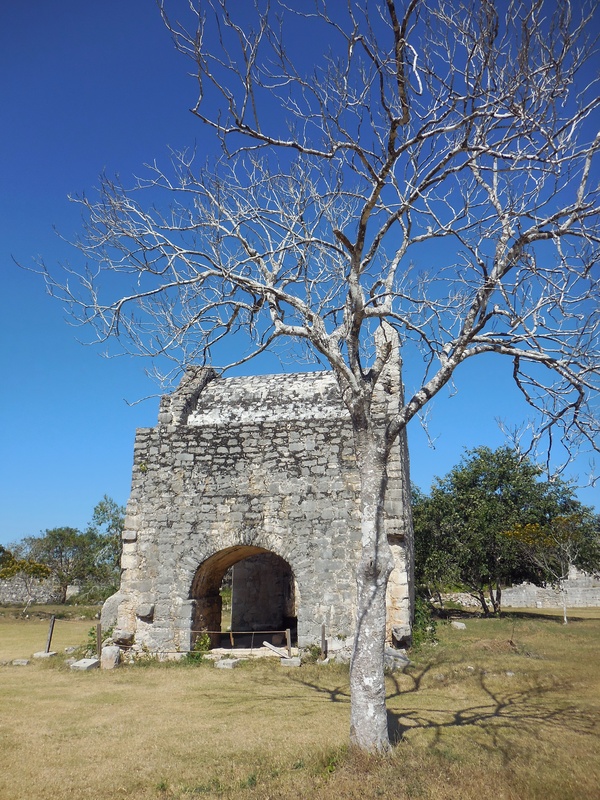 When the Conquistadores arrived they used the local stone from previous structures to build a 16th century chapel which is now also a ruin. Eight stucco masks of the Rain God Chaac were found in the Temple of the Dolls. 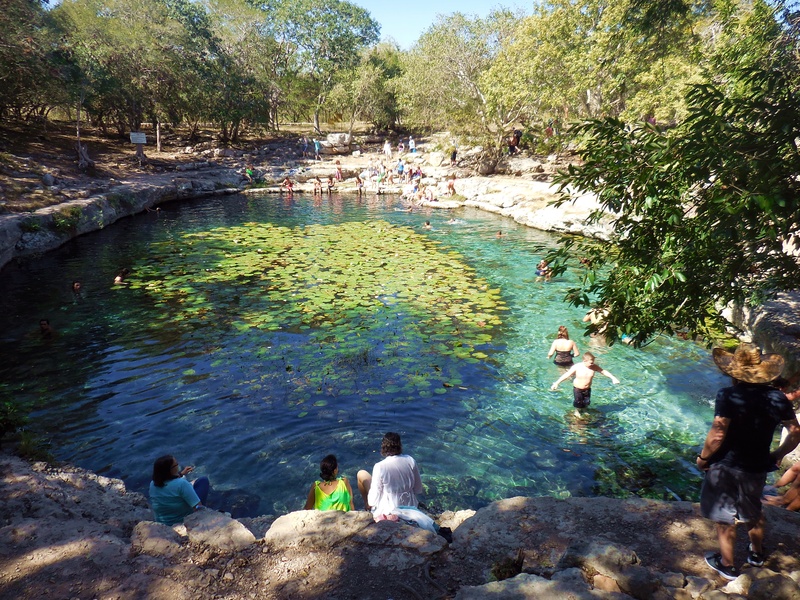 The Yucatan has no natural lakes or rivers so rain is still much needed to fill the cenotes and water crops. My upbringing in Scotland has given me enough rain to last a lifetime… At the equinoxes the sun shines right through the entrance to the Temple of the Dolls creating a fantastic effect. On a final side note, my Mexican Rose wine was quite delicious and went well with the food in Yucatan, which is hearty. The Spanish brought wine-making to Mexico and most of it comes from Baja, just below California. Doesn’t it look gorgeous? The tiles are original from the 17th century mansion. The French owners have recently created this boutique hotel and coordinated everything with the tiles. The back wall is the palest dove gray as is the new futon beside the bed. The lamps were made of local limestone and I am taking the photograph from the stairs (yes two levels) in my suite leading to the brand new bathroom. It was exquisitely designed with local stone in the huge shower. So far, so good, eh? The bed was rather hard but the bedding was lovely. 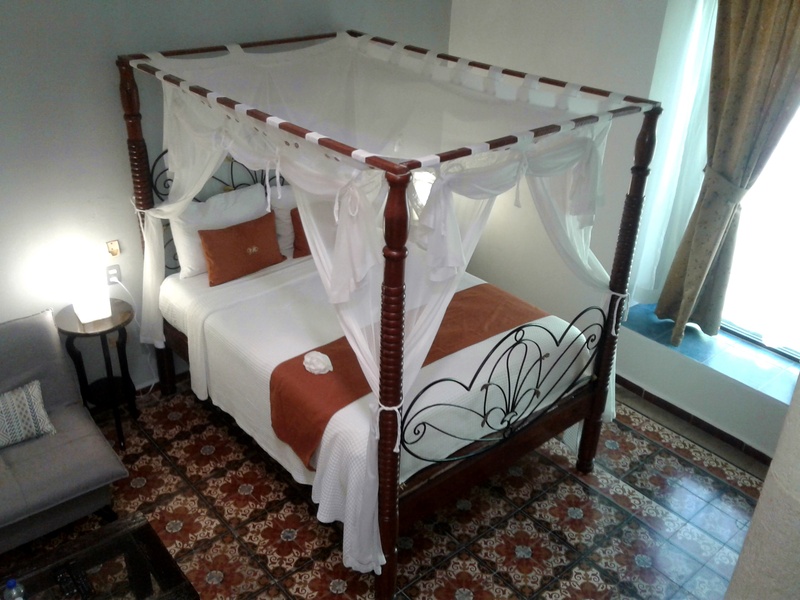 The mosquito net was not for decoration and the fumigator turned up on the second day (it smells of roses, Senorita…). I look like I have had measles. Eventually I caught one of the little f***ers and my blood oozed out of it. The exquisite shower had only cold water. On one fortuitous occasion I had a tepid shower – yay! I was offered three other rooms which barely had a trickle of still cold water and realized I had the best room. My French fellow guests had a trickle of cold water for their whole stay. Dirty froggies…🐸. I know that is terribly un PC but it’s one of my resolutions. The menu was translated by French people into English and they need not have bothered. There is a local Maya language spoken and I have no idea what the menu said. I ate dessert and breakfast with unidentifiable fruit. I rarely spoke English to anyone. Everyone at the hotel spoke French including the staff. My driver’s English was as good as my Spanish and yet we talked for hours each day. Google Translate helped with certain words until we were out of cell phone range. THIS WAS THE BEST VACATION EVER!!! I don’t know why but I loved every second of it, even my Eco toilet which means no paper down the drain (there was a little lidded bucket for the poo smeared paper). It felt like glamping or glhostelling. The day before I left I had received bad news about four friends with health and other problems. I was so upset that I momentarily considered not going. The saddest news was the death of our fellow blogger Pan otherwise known as Linda, beautifully memorialized by John Ray and Osyth. If you click on John and Osyth’s names you will see their posts about Linda. My head still has an image of her dog guarding her dead body for two days. My mental health must be stronger than I imagined and I decided that life really was too short. I compartmentalized all my bad news, got on the plane and prayed at every church that I saw in Merida. I got lost twice in the pitch black but kept finding churches so perhaps Huehuecoyotl had an auspicious plan. 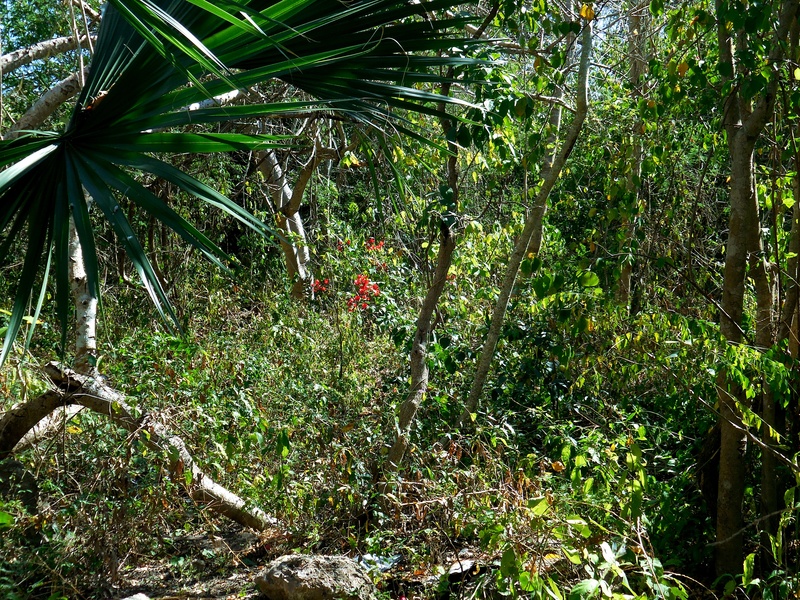 The beauty of nature and the kind, warm people of the Yucatan soothed my soul and provided much needed balm. I have many stories to tell but I have a busy week helping friends and doing paid work so it may be a week or so before I share more. Most importantly, may Linda rest in peace. She was a loyal, funny and delightful blogger friend that I will miss. 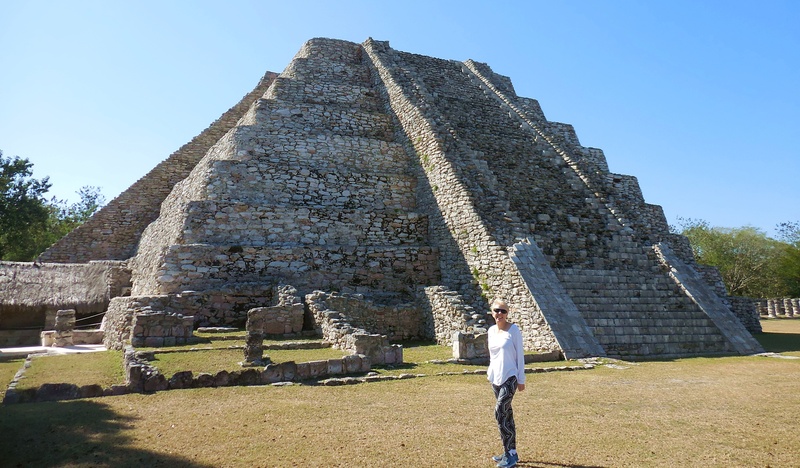 After my amazing list of resolutions, (I have done more than one #2 every day – yippee), I have a short gap before my first work contract and have decided to go to Merida in the Yucatan next week. It’s a solo visit – I don’t think Teddy is ready for one of my Spanish speaking, taking the local bus and arguing with taxi driver trips. My last trip to Merida was a disaster but despite that I longed to return in more clement weather. Huehuecoyotl had arranged for British Airways to send me an email reminding me that I had to use my Avios points. Ah ha, thought Kerry, I can book a hotel in Merida and save money. I chose the Wyndham but when I received the final confirmation, I realized that they had not used my points and cash but just cash. Wily Coyote! The only option was to phone British Airways. They have a free number in the States but you are speaking to someone in England. A very nice lady with a well enunciated English dialect answered the phone promptly – wow! It was such a relief to speak to someone who immediately understood my accent. I have no idea what the problem is in the USA – I speak clearly and you have all watched Braveheart/Outlander, haven’t you??? As soon as I explained what had happened, she indicated that it would be complicated to sort out so I would be on the phone for a while. One hour…but at least it was free. Long story shorter, the first booking had to be cancelled and then she attempted to do it again. Coyote was having fun because there were two Merida Wyndhams on the BA website, one in lower case and one in upper case. I assured my new friend that there was only one Wyndham hotel even though they had different addresses! Right in the middle of all this, my gardeners arrived. I apologized and said I would have to carry the phone outside while I spoke to them. “Hola! Como Esta”, “Bien, y Usted?” Then there was some bad Spanish when I tried to explain that I needed a brick stand for the Casa de Gatta (Katniss). The nice lady said, “Do you live in Mexico?” Well, if you ask a Trump voter, they might say yes, but really we live in the bilingual metropolis of Houston. I used eastern Europeans in England as an example. New immigrants always do the jobs that no one else wants to do. Back to the strange website; neither the UPPER CASE nor lower case Wyndham would take my money or booking. Likely they had no rooms left – welcome to Mexico! Finally I decided that I would just completely cancel all bookings with British Airways and ponder what to do next. The nice lady was very apologetic and had even reduced the price before I was banished from that hotel. We bid each other goodbye and I wondered if she was going to tell someone about her strange conversation. What was even funnier, in the middle of all of this, Toffee had a poo (great resolution) in her litter box and started caterwauling for me to clean it stat! She was so loud that I had to apologize for that noise whilst escaping to the other side of the house with computer and phone to get away from the noise of the gardeners. So, I sat thinking about a possibly ill-fated trip but was so amused by the whole situation that I decided to just do a Booking.com. They allow you to cancel close to the trip time and you don’t pay until after you arrive. They were problematic the last time (my hotel was not available and didn’t find out until the night before). 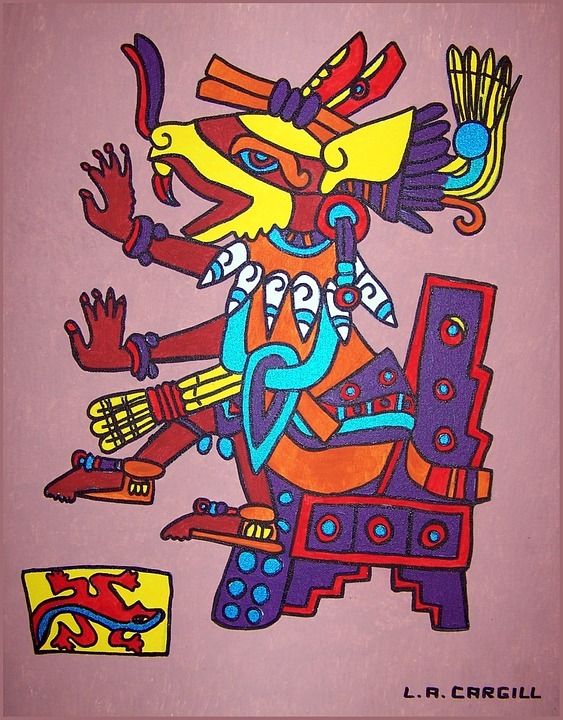 Maybe Huehuecoyotl would help out? I chose the first one that had a great review and it is a 17th century mansion – uh oh. The hotel immediately confirmed my booking in Spanish – excellente and it is so beautiful that I could just photograph that building. I am going next week and Teddy is looking after the gattas. Wish me luck and hope that my puppy God wants to play nice. 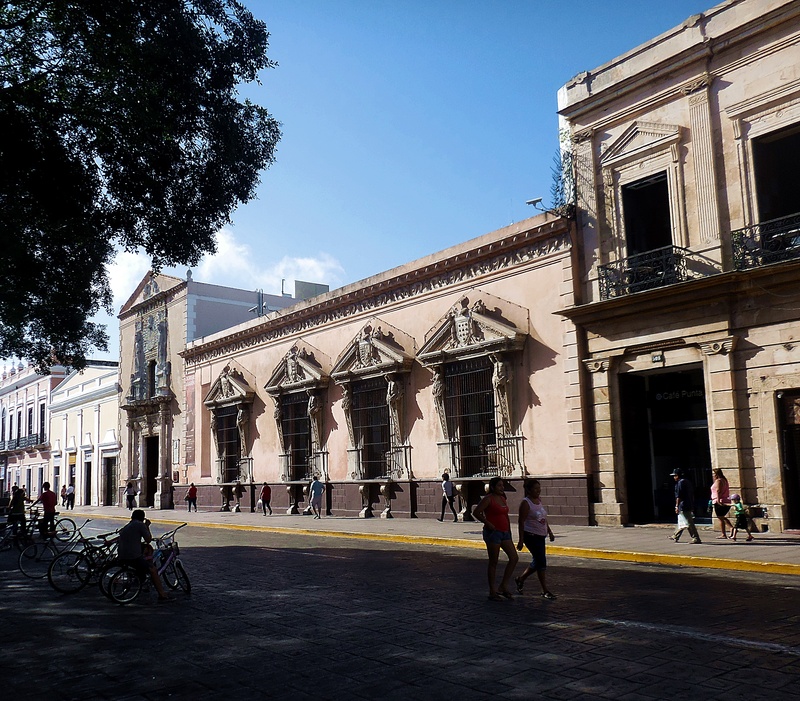 As I walked along this elegant boulevard, the Paseo de Montejo, in Merida, I felt like I was back in Madrid. I imagine the Spanish conquistadors also wanted to recreate a feel of home although I believe the design was influenced by French boulevards. 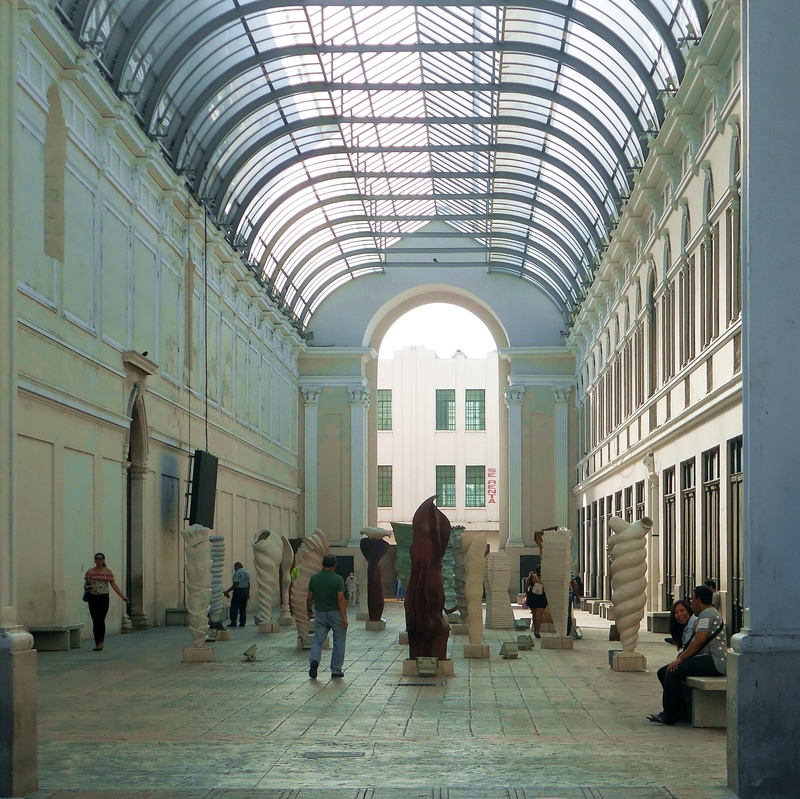 This pastel avenue of sculptures was located right next to Merida Cathedral and was a wonderfully cool and artistic respite from the unrelenting heat. Most people were not tourists so it was joyful to see residents enjoy their beautiful city. These wonderful windows caught my eye – such a tranquil Sunday feel to the day. Below is a close up of the detail. There seems to be different coats of arms above each window. 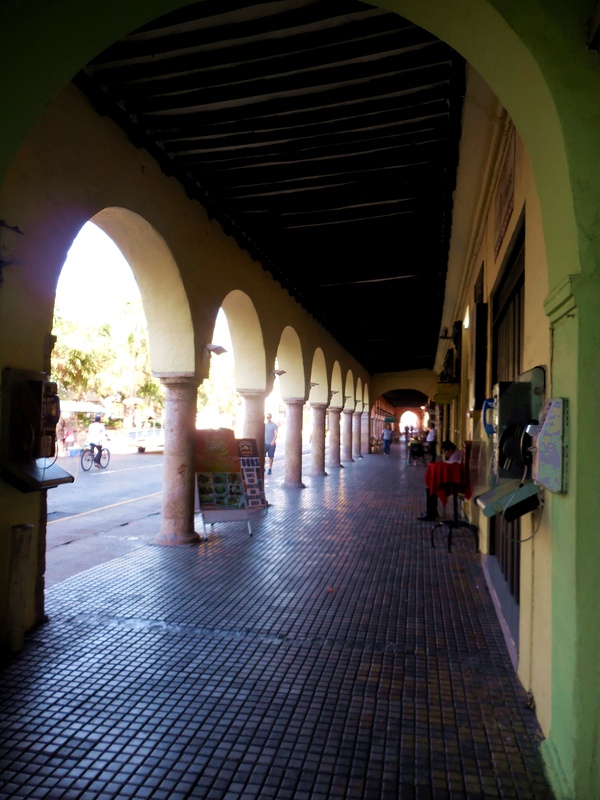 My absolute favorite was the colonnades of the Plaza Grande which was also the original center of the Maya city of Tiho. I liked this vivid statue in Merida but I mostly took the photograph to showcase the colorful buildings behind. It was only when I zoomed in on the image that I realized that this was Andrès Quintana Roo for whom the state is named. 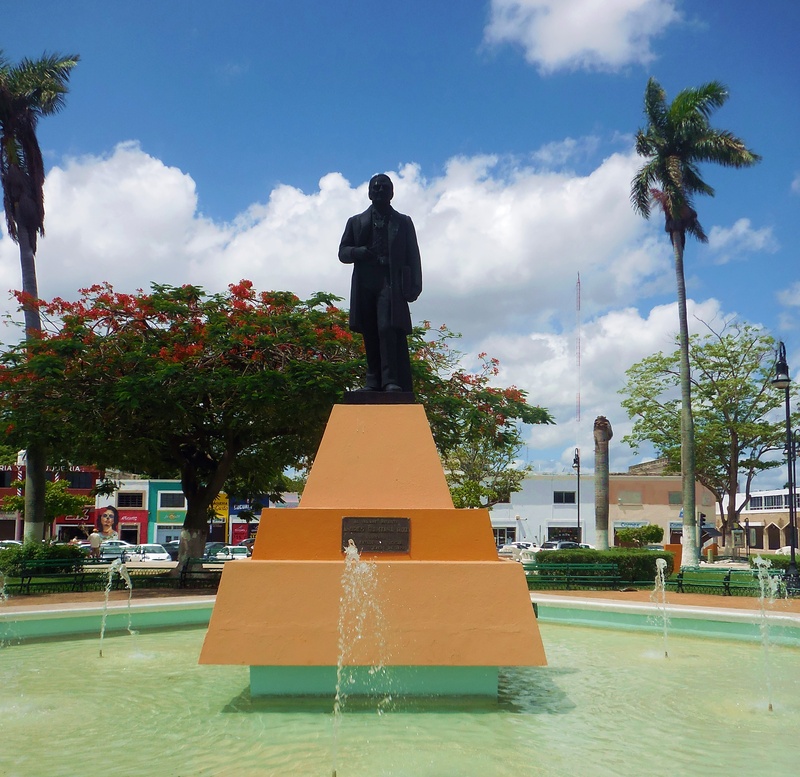 He was born in Merida in 1787 and died in Mexico City in 1851. Not only did he draft the Mexican Declaration of Independence but he was a liberal forward thinking politician whose roles included Secretary of State. He had a Romeo and Juliet romance with his wife Leona. Her family were Royalists so they ran away to get married. Andrès’ father was part of a group called the Sanjuanistas who fought against native slavery and oppressive taxes to the Catholic Church. Go Sanjuanistas!! We sometimes forget that the USA is not the only country who participated in slavery. There are many African Americans in Texas who have my Scottish last name and I have no doubt that there will be many native Mexicans who are called Ortega, my maiden name. For all I know some of my native DNA might be Maya or from the Mexican region although I doubt it. 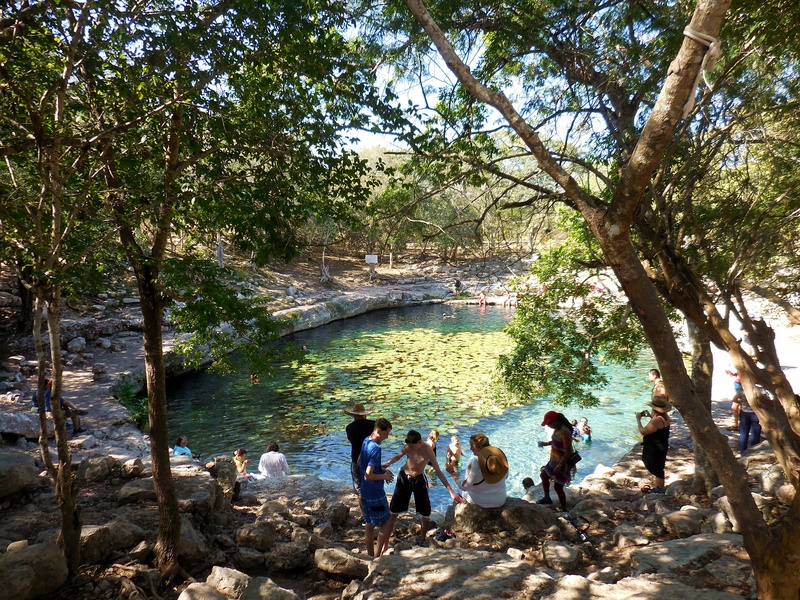 Back to Quintana Roo –in this state you can clearly see native heritage in the faces of residents. Less Spanish, more Maya. On one side of Andres’ statue was the church of Santa Ana. The yellow towers made the red brick stand out. Look at those flame trees! In another neighborhood, I was taken by the contrast of this yellow column against the red umbrellas. 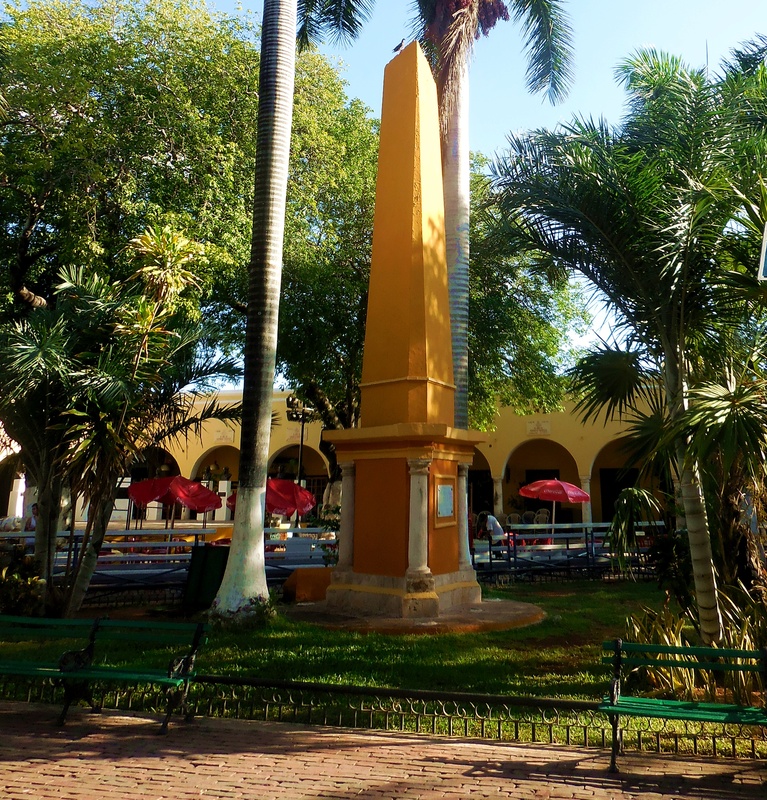 Yellow seems to be a favorite color in Merida – so sunny and vibrant! My good friend Victo Dolore recently posted one of her wonderful short pieces of fiction Post Pains. She asked if any of her readers felt something from a building. 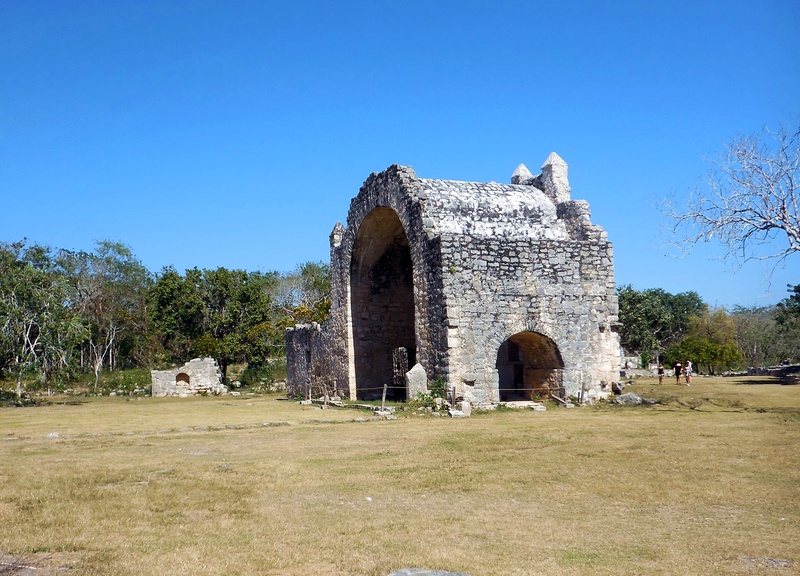 Since I am a certifiable ball of emotions and feelings, it happens to me all the time and despite the candy colored buildings of my last post Colorful Merida, the graveyard (pictured above) made the hair on the back of my neck rise. There is something about the bells and the three crucifixes that seems so sinister. It was naturally shaded so that heightened the effect. 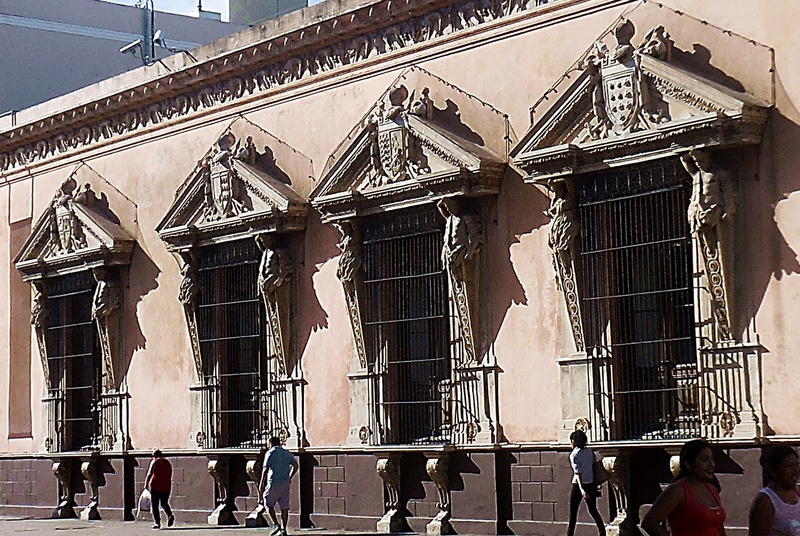 Maybe it was because Merida Cathedral was once a Maya temple? The interior of the Cathedral was somberly beautiful but there was no color which is unusual in churches here or in Mexico. Even the nuns were wearing off white habits. Is it the gray of the limestone that bothers me? Limestone church and a local with her slippers on? Que? Perhaps it is those little slits for windows (perfect in a heatwave) that upsets me? Finally, why do I take most of my photographs from a weird angle? I have to straighten most of them but it truly reflects what this photographer sees. My thinking is skewed because of a mental illness, as is my take on life. It is not always negative, however, and like most people I like to be scared (a little). Boo!